Built in 1849, the wooden frame Hockanum Mill is the oldest surviving textile mill in Rockville. The Hockanum Company was first established in 1838 to manufacture satinet. In 1858, the company began production of high grade cassimeres from domestic and imported wool. By 1903, 400 workers were employed. A brick mill was added in 1881, and a reinforced concrete building in the early 20th century. George Sykes took over the Springville Manufacturing Company in 1886, demolished the old mill which stood here, and built this brick mill to manufacture fancy cassimere and worsted fabric. The Springville mill supplied the cloth for the suit worn by President Harrison at his inauguration in 1889. In 1903, 350 employees worked here. It is an apartment complex today. Built in 1864, the Florence Mill is an early example of the French Second Empire style applied to an industrial building. The mansard roof is characteristic of this architectural style. In 1881, envelope manufacturer White, Corbin and Company bought the mill. They were acquired by the United States Envelope Company in 1898. Envelope manufacture continued here until the 1970s. 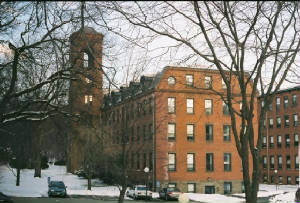 The building is now used for elderly housing. 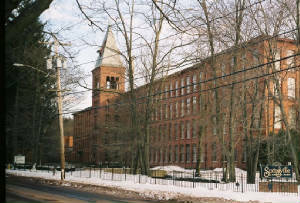 Click to continue tour of Rockville Mills.